What is the German Unity Transport Project 8? 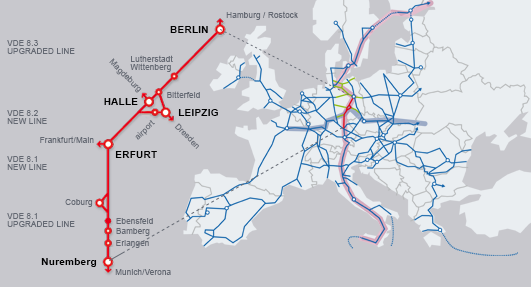 In the plans for a trans-European transport network, the rail link that runs from Italy through Austria to Munich and continues via upgraded and new lines in Germany from Nuremberg to Berlin, finally ending up in Scandinavia, is referred to as Project No. 1. VDE 8 OVERALL: Info brochure: "The largest rail construction site in Germany Upgraded and new lines between Nuremberg and Berlin"